Day 4 started at Loewe, where Jonathan Anderson dressed his models in long and lean silhouettes. Tailoring is left soft and fluid, while dresses were disguised as separates with sweater tops and silk skirt bottom halves. The most standout accessory was arguably the ‘propeller’ hat, while there were also plenty of new, covetable gate and puzzle bags. What really makes leather atelier Moynat stand out is creative director Ramesh Nair’s daring and innovative sensibility. We’ve seen cubes and pyramid shapes transformed into minaudieres in the previous seasons. For autumn/winter 2019, Nair introduces a round hat-box inspired vanity bag and the pyramid turned upside down (complete with an attached metal stand to keep it from tipping over). If there’s one designer that can make pink look dark and, dare I say, badass, it’s Rick Owens. While most of the models sported post-apocalyptic ensembles in dark and earthy tones which consisted of round shoulder coats, rolled and wrapped tops that turned into skirts and squared for platform boots, it was the finale evening looks—draped gowns in dark pink, violet and crimson (often with matching stacked platform boots)—that stood out. 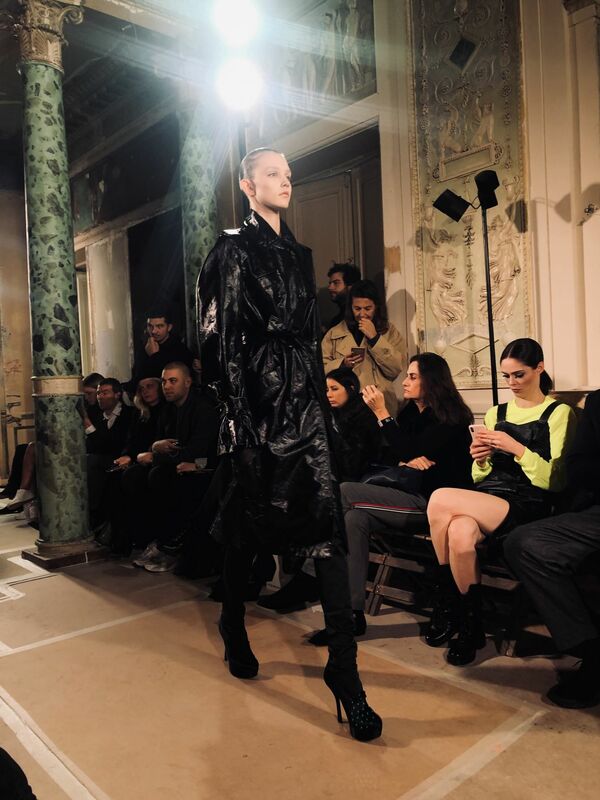 There’s something wonderfully romantic about Olivier Theyskens’ dark approach to fashion. While the colour palette of the collection was kept predominantly black, it was the figure-flattering lace dresses and Victorian-inspired jackets that struck a chord. Close friends of the designer such as Coco Rochas and Julia Restoin Roitfeld were also spotted front row to support. British designer Alessandra Rich has a big following—you can see this by the number of women dressed in her designs sitting at her show. Her collection, entitled “Dressing for Pleasure”, consisted of a range of retro-inspired evening dresses, Swarovski encrusted body stockings and even lace body suits which left little to imagination. While many of the audience members already have Alessandra’s oversized crystal earrings and headbands, they can look forward to accessorising their looks with chokers and crystal body chains in the new season. New York by way of Uruguay, designer Gabriella Hearst is an outerwear extraordinaire. Just a quick glance at the showroom and you will fall in love with her streamlined equestrian coats, and knit sweaters with matching skirts carefully crafted from upcycled wool. Hearst’s runaway hit accessory, the Nina bag, is available in almost every colour imaginable, but new styles worth nothing include a hard case crafted from marble which has a screen to show the time on your iPhone. Hedi Slimane’s debut for the house of Celine last season was definitely heavy in evening wear—'90s sequined mini dresses (worn under leather jackets) immediately come to mind. For his second women’s collection, Slimane harked back to the '70s and '80s and put emphasis on daywear—blouses with bows were styled with fitted jackets with exaggerated shoulders and matched with blue jeans or pleated culottes, topped off with knee-high boots.